After a bit of deliberation we bought a last minute ticket to Paris on the Eurostar. I loved our time in London but was super keen to get to the land of croissants, cheese and wine! We took an early train into London Euston and went through the new terminal. It was surprisingly fast and the best part was someone came and found me at the end of a long queue and opened a lane for us as we had small children! Errr That hasn’t happened anywhere before! Well done Eurostar! 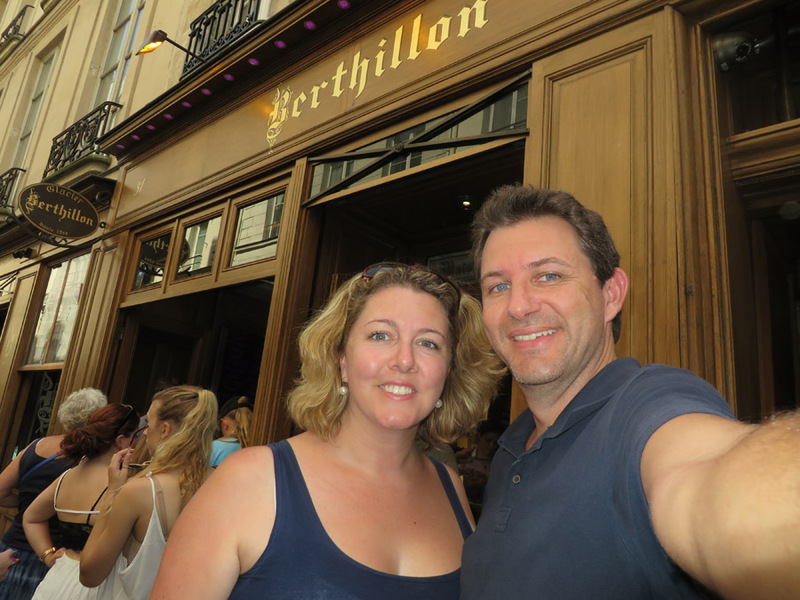 The train was fast, clean and got us to the centre of Paris in less than 2 and a half hours – A much better option with kids! We had booked an apartment on AirBnB in the Marais district which was small but clean and tidy, and magically found it as soon as we came out of the Metro. After we had met the owners and settled in we took off for a walk in the sunshine. The first thing I did was buy a Baguette for the kids to nibble on while we walked. Good move, as it meant we could take longer to choose where to eat lunch! The weather was perfect on the first few days and then a heatwave kicked in (should I have known it was the only heat I was going to get for the next 5 weeks – I might have enjoyed it a little more!). The city is designed to trap heat in the colder months, so there is little airflow and very few cooling devices! 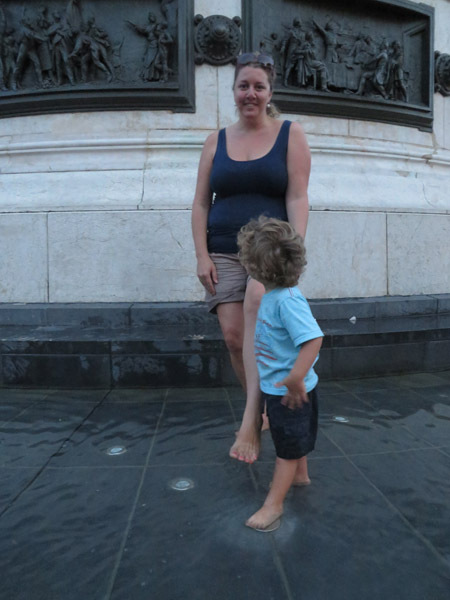 Nevertheless there are many fountains to dip your feet (or your children!) in as you walk around and enjoy the charming streets. 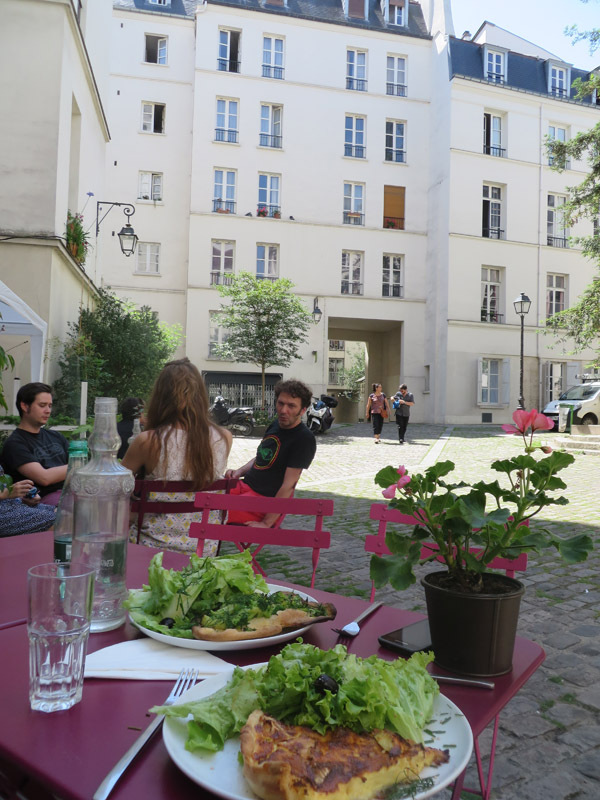 On our first wander we came across a delightful little side courtyard where we found two little cafes. We ordered some lunch and the kids ran around in the sun happily playing. The tartes were excellent, probably the best I have ever had, and it was so lovely to just soak up the Parisian atmosphere! 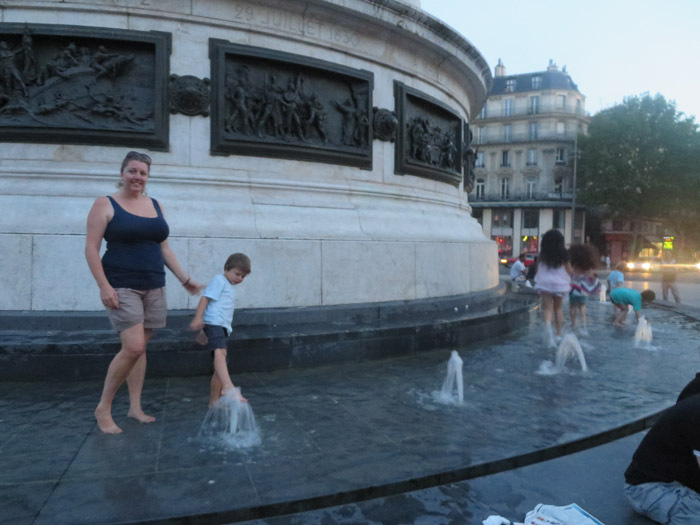 We stayed in Paris for 5 days and spent most of the time walking around with the kids. We have been a few times before, so we had seen most of the main tourist sites. This made it such a pleasurable trip as in July/August the queue for most of them (Eiffel tower, Notre Dame, Louvre etc) is around 2 hours. The streets of Paris are pretty clean (other than the occasional dog poop) and are often lined with lovely little shops, restaurants and cafe’s. We bought the kids their first chocolate crepe which was a huge hit, and magically stumbled across an ice-cream shop that we had first been to back in 2000. My dad tells a tale about this ice-cream shop and always swore that if any of us kids found it we would automatically become his favourite! (since then all of us have been LOL). 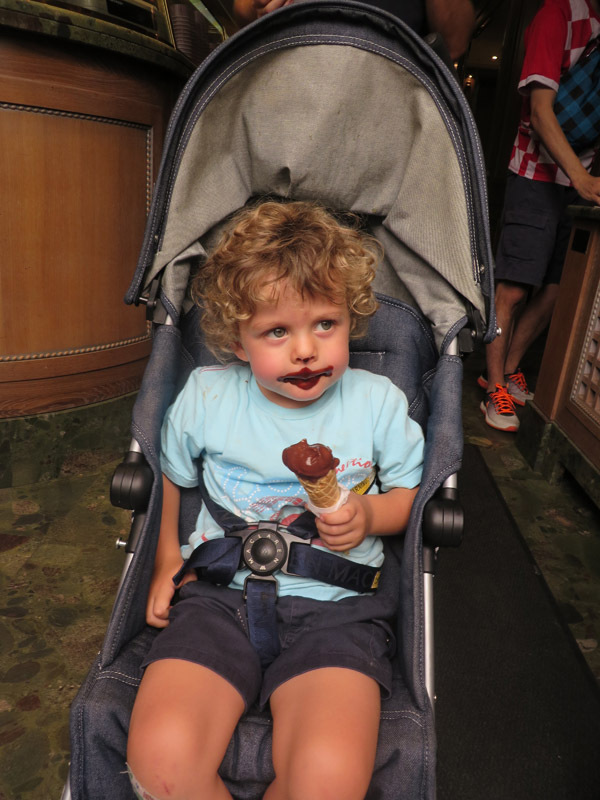 He stumbled across it with my Mum in the 70s and thought it was the best ice-cream in the world. To be honest, I have been to my fair share of ice-cream shops and this one is by far the best. This is kind of handy as the queue was about 45 minutes just for a scoop! On the plus side, we were entertained by all the Asian tourists who walked by and tried to photograph Milo while pretending to take a picture of something else! It was a laugh. The icecream is divine, I can thoroughly recommend it. 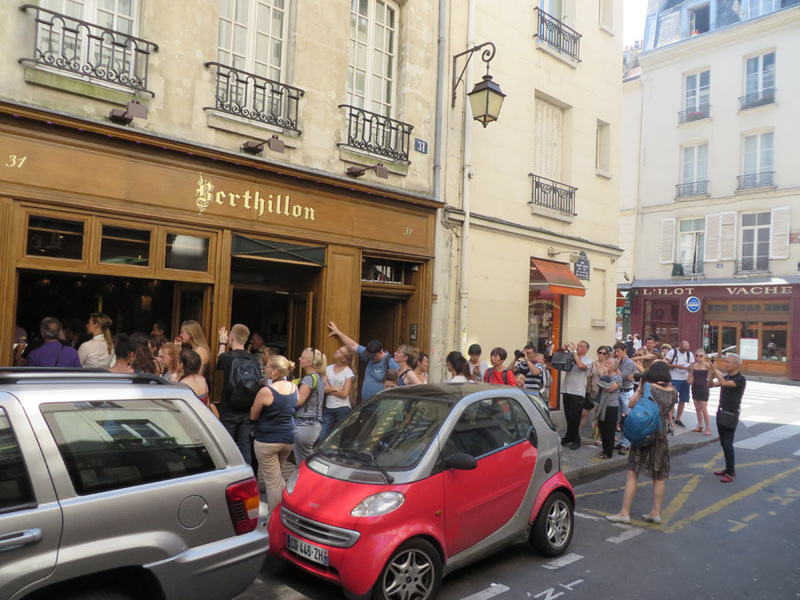 You will find Berthillon near the back of the Notre Dame Cathedral, on Rue Saint Louis En L’ile. Go …. it is worth it! I’ll start my next bit by saying I am not a fan of the Metro (or any underground train for that matter). The Paris Metro is dirty, smelly, hot and full of very pushy people. I LOVE to walk through the streets – not only do I feel like I actually know where I am but I also get to know that particular neighbourhood. I think this all stems from when I lived in London and I once caught a train from Bond St to Marble Arch which involved climbing up and down about 8 flights of stairs, a 5 minute wait and a 1 minute train time, only to walk back up to the street and still be able to see Bond Street station which was about 100 m away LOL never again did I make the same mistake! 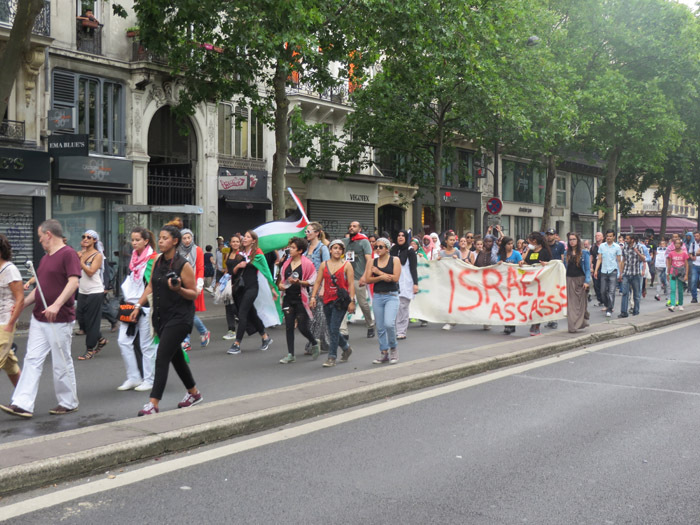 So when we took the Metro across Paris one warm afternoon I wasn’t too excited to pull my kids of the station and find ourselves in the middle of a huge protest. This photo doesn’t really do it justice as there were just so many people. We walked with them for a while as they were all heading in the same direction as us and for a few moments it looked fairly harmless. Then a man rushed up to us and told us to take the kids and run in the opposite direction. The riot squads had all turned up and we could hear all the commotion. So we took his advice as calmly bolted! It was all a bit scary but at the same time it was quite profound as I really could physically see the freedom of the French people (which is the same as Australian’s) and their rights to protest. On day three we encountered a heat wave. It was soooooo hot! Fortunately all over Paris there are cool water fountains (for filling up your water bottle) and also great big water fountains for splashing in. This one below was in Republik and the boys loved it! The also had tiles/pavers on the ground with water splashing up but I didn’t get a photo. We took the kids there three nights in a row to cool off before bed and burn some energy off! It was loads of fun and lovely to see how many people we out and about with their families. There were lots of people picnicing in the parks and sharing a drink on park benches. All the kids (and a few adults) were in the fountain playing and the whole square had a lovely feel about it! It was the perfect way to end the perfect day! Baguette: 60cents – although they range from 30cents to €1.50 for a medium sized one.